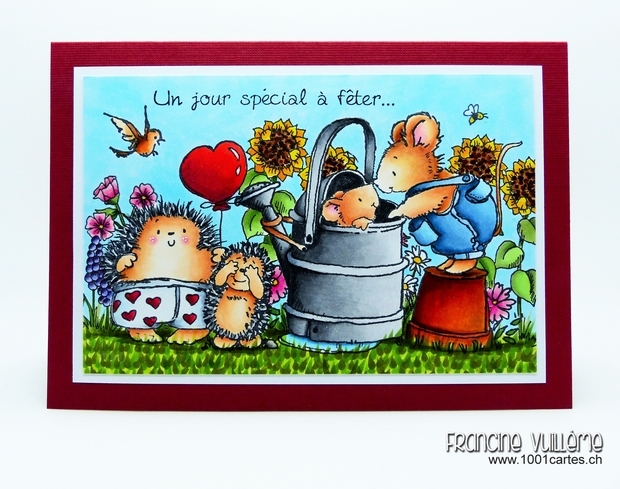 For this card, I made a scene using 8 stamps (+ the sentiment "Un jour spécial à fêter..." from Bloomini Studio) from different companies that I colored with Copic markers. The hedgehogs and the mice are stamps from Penny Black called Hot Pants and Hello Dear. The cute little bird is from Art Impressions, the flowers are from Stampin.com, Holly Berry House and a few more. Hope you like it! I am nor even sure how to express the absolute, complete, TOTAL delight and awe I feel at this AMAZING, AWESOME, INSPIRING, INCREDIBLE, FANTASTICALLY COOL card - you made the cutest scene and it is colored so PERFECTLY!! You have just made me so happy with this delightful, and SO SO charming card!!! I could look at it for hours!!! WOW !!! Deine Szene wirkt wie ein ganzer vollständiger Stempel. Deine Coloration ist umwerfend! What a fun card! It's so beautiful, and such a wonderful scene. Thank you so much for sharing such an amazing card. 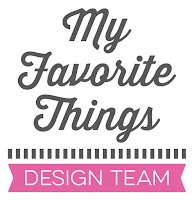 Can't believe that you still find time to create such elaborate scenes with all the design teams you're in. But I'm so happy you do. This is just fabulous!! Do you or have you made a YouTube video showing how you create your scene's like this? Oh, sweet Francine (aka Heidi while we were in the Dirt Pile...thanks to Susie)! I love this card and continue to be amazed at the skill and artistry of your masking and coloring! Stunning card, sweet friend! Has it been that long? Hugs!